Volkswagen’s Super bowl commercial puts us back 15 years, thank god Goldieblox is there to set them straight, and then Microsoft reminds us that technology is really about improving the human experience. What? You watch the super bowl to see the game?! Even if we did consider that (only for a second), we quickly gave up as soon as Peyton Manning couldn’t get the ball across the touchdown line for THREE WHOLE QUARTERS. We don’t care that he set some kind Super Bowl completion record, it was BAD. Fortunately, the commercials were there to keep us entertained. Not only was it weird, but it demonstrated a pretty dim view of the engineering industry: evidently, almost no women nor people of color work for Volkswagen as an engineers, and the three who do never earned their angel wings. Fortunately, Goldieblox was there to set those Germans straight. Goldieblox, a children’s toy company, won this ad in the Intuit Small Business Big Game competition. In the ad, a group of girls decide enough is enough and it’s time to build a rocket to shoot all of their pink and frilly toys up into outer space, where they belong. Little girl rocket engineers saying NO THANK YOU to Hasbro and the like? Now that’s a view of engineering we can get behind. And yet, even Goldieblox couldn’t compete with the inspiration coming out of Microsoft’s Superbowl ad. 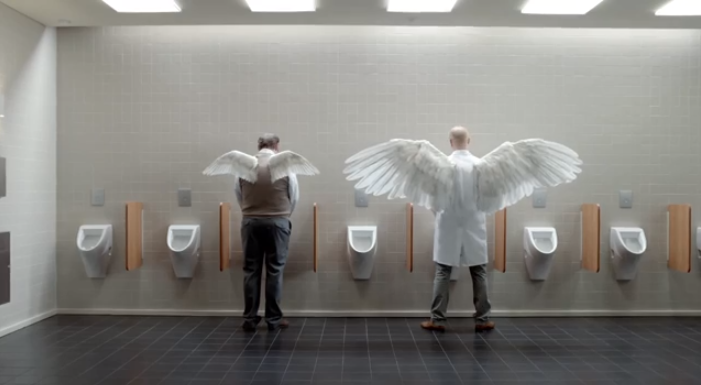 Get your tissues handy, because this ad is a doosey. The ad begins by asking the open ended question: what is technology? It then counts, one by one, moments from the last few years where technology has changed the lives of individuals by giving them the ability to see, hear, speak, and walk, and allowed others to participate in big life moments, such as the birth of their child, even when oceans away. And then the end, featuring retired NFL player Stephen Gleason holding his son in his lap…heartbreaking. Really, our description can’t do it justice. Just. Watch. It. Now.